Mobile, we are out and about! An amazing relaxing remedial massage using high quality massage oils mixed with beautiful aromatherapy essential oils.. A Full Body Remedial Massage using @LarissaBrightAustralia Skin and Body Care product range including blends of Essential Oils. Internation Contour Body Wrap – Guaranteed up to 15cms loss * Due to Detox effect of the wrap. Not weight or water loss. Contact for more information. Amazing Kickoff to Healthy Lifestyle Change! Deluxe Hands and Feet Scrubs and deep moisturing Treatments with Reflex Massage using Hand and Nail Tonic and Peppermint Foot Balm to Finish! At BB M & NT we believe in an hour massage being the full 1 hour (or whatever applicable service you choose!) The time starts from the first touch ensuring you receive the full hour treatment for Deep Relaxation maximizing Peace, Serenity and providing a rejuvenating recharge! Julie suggested a massage after my doctor had said surgery is the only solution for my carpal tunnel pain and symptoms. After only one one-hour massage last week, the symptoms are almost gone and I'm sure it will disappear with a few more sessions! Thanks Julie! I'll be sending my mum and daughter to you to "stroke away" their aches and pains too! I visited Julie for a 1 hour massage last week due to a few pains around the neck and back area. And it was a relief to finally find someone who uses just the right amount of pressure without the pain that comes with it. Great to find someone that actually uses their hands as well for the entire massage. Looking forward to seeing you again in a few weeks Julie. Ultimate Indulgence Vegan Facial with Mask and Miracle Elixir Deep Moisturising Treat and a Walnut & Comfrey Back Scrub removed with Hot Towels and finished with a Peppermint & Lavender Balm for deep, soothing de-Stress! At BB M & NT my focus is on Detoxification and De-Stressing the Body. Toxins and Stress KILL the body. We want Life and Life more abundantly. My desire is to bring Peace, Hope and Life to those searching by combining products and services to aid these processes and a Holistic approach to wellness. 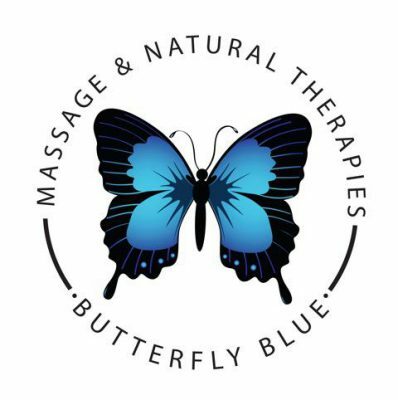 Copyrights 2018 © Butterfly Blue Massage & Natural Therapies.